It wasn’t all that long ago that 243-ways pokie machines revolutionised the way we played online slots. Now, both casino software developers and makers of land-based pokies alike are pumping out an exciting new breed of games that offer from 1024 up to 3125 possible winning combinations. We at OnlinePokieGame have tried out a few of these incredible new all-ways Internet slots, so let us show you how they work and where you can find the best real money pokie games online. Each of our recommended slots casinos boasts hundreds of Web pokies and progressives, an array of banking methods for deposits and withdrawals with the Australian dollar, and 128-bit SSL (Secure Socket Layer) Digital Encryption to keep all real cash transactions safe and sound. This is our top-rated real money casino for pokies online, with more than 400 Microgaming slot titles on offer. Sign up at Royal Vegas now to claim up to $1200 in bonus cash. Players love this authentic online casino, which not only offers hundreds of popular Internet pokies but will also give you 50 free spins on a hot pokies game just for signing up. In addition, G’day also offers an unlimited matched deposit upon all transactions made by new players. Slots Million is a true haven for pokies lovers, with over 1800 unique pokies titles to choose from, from developers such as NetEnt, Microgaming, BetSoft, iSoftBet, Rival, Thunderkick and many more. Sign up to receive double your first deposit up to $100. There are more than 250 online pokies to choose from at AllSlotsCasino.com, all designed by Microgaming – the industry leader in Web casino software. Register today to take advantage of the $1600 signing bonus. We highly recommend House of Jack for Mac and other non-Windows computers, as its complete catalogue of 300+ real money pokies and progressives is available via instant play. Check out the stellar range of BetSoft’s 3D slots and get up to $450 and 100 free spins when you sign up. These new 3125 and 1024 ways-to-win poker machines operate in much the same manner as the 243-ways games, but with a far greater spread of winning combos available. Where traditional five-reel slots typically offered between five and 25 paylines, all-ways pokies scrap the lines and allow us to collect on every possible winning sequence. This means symbols don’t need to settle in a specific pattern, as per tradition, but can be connected in any direction across the five reels. The total amount of potential paying combinations is determined by the number of active symbols on each reel – so the more panels there are in play, the more payouts are up for grabs. Working out the mathematics behind it is actually quite simple. On a 1024-ways machine, there are five reels and four visible symbols per reel. Thus: 4 x 4 x 4 x 4 x 4 = 1024 potential win-lines on any given spin. On a 3125 ways-to-win slot, however, we can see five symbols per reel, and so: 5 x 5 x 5 x 5 x 5 = 3125 paying combos. Our trusted AUD online casinos offer several 1024-ways pokies, all loaded with features, bonus rounds, and tasty in-game jackpots. Here are two we reckon all slot jockeys should check out. This Microgaming release takes us on a thrilling treasure hunt through the icy tundras of the frozen north. 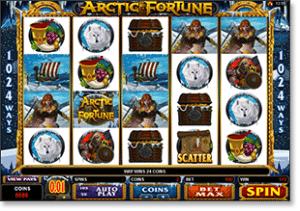 Beautifully animated with a captivating soundtrack to match, this Viking-themed slot offers up free spins and features aplenty with wild multipliers (shield), scatter symbols (map), and a bonus round with a 90,000-coin jackpot. We don’t have to wait for the festive season to enjoy this 1024-ways digital pokie. 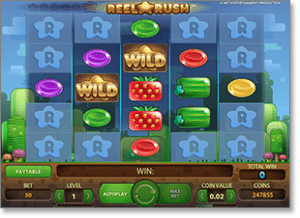 It comes loaded with no less than seven distinct features, including wild boost, mystery multipliers, and the trademark ‘Rolling Reels’. High rollers take note, as playing the maximum 500-coin bet will put you in the running for a top prize of up to 2,300,000 coins. The 3125-ways Web slot is a bold new concept, and so at present there aren’t a whole lot of interactive pokies that employ this format. We expect this will change very soon, however, as the technology is already in high demand from Internet punters all over the world. Below are a couple of 3125 ways-to-win slot games currently available to Australians online. This unique take on the all-ways format comes courtesy of Net Entertainment. The aesthetics are familiar enough, with a bright, almost cartoony theme that reminds one of Nintendo games such as the Kirby’s Dreamland and Super Mario Bros series. At first, you may wonder how the diamond-shaped layout of the visible symbols could possibly offer up 3125 ways to win. Enter the very nifty re-spin feature, which expands the playing field to reveal new spots and symbols and thus increase your chances of winning – and winning big, with a 480,000-coin jackpot on offer. Another game-changing design from Microgaming, this may seem like a stock-standard Internet pokie at first glance. The jackpots appear modest compared to other advanced slots, but the 3125-way format combined with the stacked wilds feature means we can in fact bag up to 7.5 million coins on a single spin. Best of all, we can cover every paying combo whether we play the minimum bet (50 coins) or up to the max (250 coins). This is a must-try game for all pokies enthusiasts.